This is the park we were all waiting for. Cairo had flown down to meet us in LA for her semester break, and we’d spent the last few days at Disney and Universal, where the rides are fun, but we wanted more! 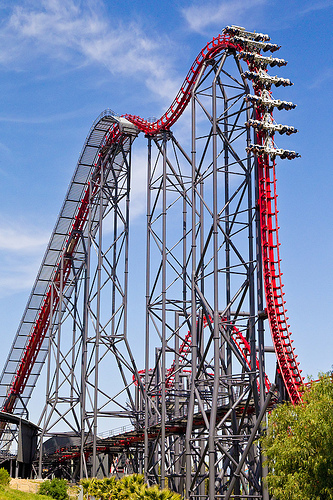 We knew Six Flags Magic Mountain was more of a thrill ride park with lots of roller-coasters, and we were raring to get at it. It was a long drive up to Valencia from Anaheim, and took us about 1.5 hours but we were hoping it would be worth it. The map shows all the ride locations and groups them into categories as Thrill Seekers in Training, Moderate Thrills, and Maximum Thrills. 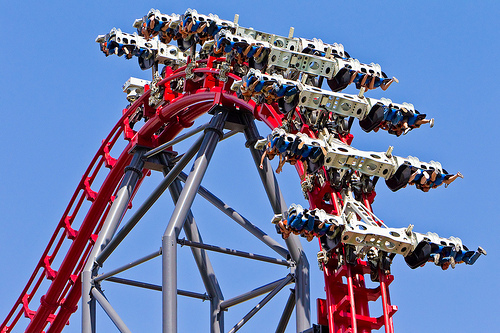 We were tired of wimpy rides so we went to the first Maximum Thrill we came across, the X2. The park hadn’t looked that busy but it ended up taking us 45 minutes to get to the front. As we got further in line, I began to worry about this ride. The signs all talked about how it was scary dangerous, made for extreme thrills. We couldn’t see all that it entailed, but we did see that the cars all turned upside down and around 360 degrees, and that our feet would be dangling free. Closer up we were warned the ride included loud music and sound, fire, lightning and fog effects. “The world’s first 5th dimensional ride!” they called it. In the staging area, there was a loop of a woman’s eerie voice whispering “X2” and a man saying “Is everybody in?” Once we were in, a Sinatra rendition of “It had to be you” started playing to be interrupted by Metallica, and then Rage against the Machine. It was like a creepy horror soundtrack, and the point was obviously to build up stress. We were flipped backwards as we were pulled up the hill. I felt a terror trying to take hold in my sternum, but I kept pushing it back, focusing on the beautiful view of the valley below. “Breathe … one … two … three … four …”. We got to the top and I expected us to go down backwards, but we just did a dip, and then came up. It confused me and that was obviously the purpose. 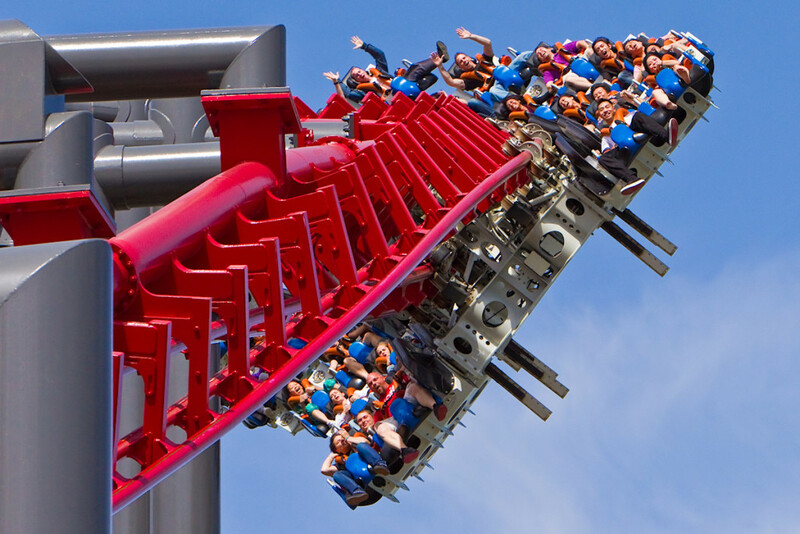 Our seats flipped around upside down and we were looking straight down at the ground …stop … one … two … three … it let go, and we were flying down the 215′ drop to the bottom face-first. At this point I was a screaming, freaking, swearing, fear-crazed mess. An endless stream of swearing and screaming and just plain horror. It’s safe to say that I absolutely despised this ride. It was, unquestionably, the worst experience of my life. It was every nightmare come true, with the disjointed music, noises, jerking, falling, and flipping over and over and over yet again. I couldn’t tell where we were or where we were going. I just wanted this hell to be over. Harold? He sat next to me, giggling giddily. When we came into the station, we stopped, but they didn’t let us out immediately. Suddenly, we started again, and I thought they were going to make us go all over. I almost lost it at this point, and was about to start screaming hysterically to let me out, then we stopped, almost as quickly, and were released. Dignity saved, but just, teetering on the precipice. Exiting the ride, I couldn’t get out of there fast enough, but then it was like I was in a state of shock. I couldn’t even begin to think about what we’d just gone through. Poor Cairo had banged her head badly on the ride bar and I couldn’t pay attention to her. We walked down the hill, Harold all smiles, Cairo holding her head, and me in a fog. Near the bottom, tears started to stream out of my eyes. Not tears of sadness, it felt more like a release of the stress. I was very thankful I had dark glasses to camouflage my reaction. At this point, I was terrified of going on any of the other rides. 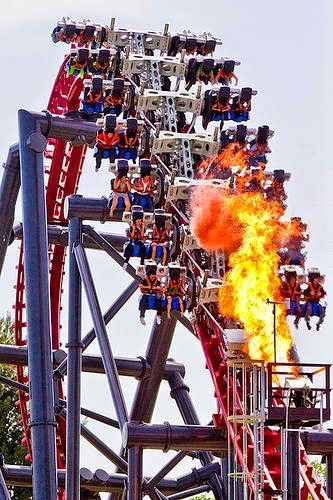 In the past, every ride I’d ever gone on had scared me, but after I’d done it, I’d come off feeling wonderful, with all the adrenaline flooding my body. I’d always felt trust for the ride achitects, that they’d not build something I couldn’t handle. Things were different now. These damned Six Flags guys had messed things up and I could no longer trust I’d be okay. Cairo and I agreed we didn’t want to go on any more of the Maximum Thrills. We were probably more of the Moderate Thrills type. 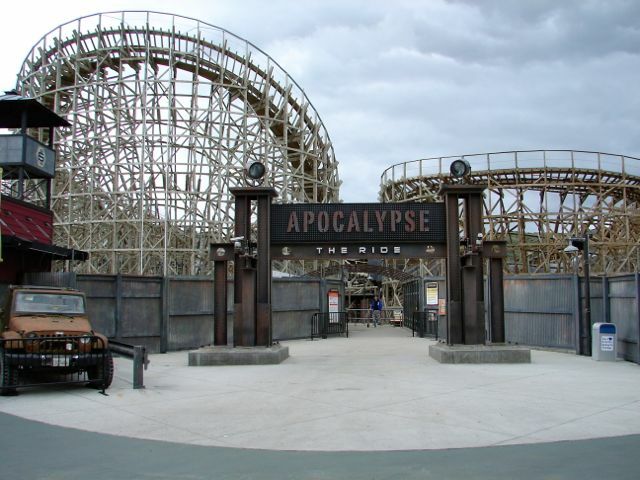 Apocalypse was described as a modern roller coaster with the nostalgic look and feeling of a classic “woody”. It looked much like the old roller coaster we have in Vancouver, a ride we’ve always loved. The line length was deceptive. It looked short on the outside but once you got inside the shafts that lead up to the station, it seems to go on and on. It was well over an hour before we got up to the front. I was still recovering from X2, but I kept telling myself this would be better. We got into the cart, and put on our seat belts. The bars came down and clicked in … for everybody else. Mine was loose and unclicking. One of the ride operators came by and checked Harold’s and Cairo’s but not mine. I called out to her but she kept going and Harold told me another woman was coming up my way. I looked back and saw her fiddling with a man’s bar near the back. The second woman came up to help, and then they started to walk away. I kept thinking of how it was another Six Flags park that a woman had fallen out and died just this year, because they hadn’t made sure her bar was closed. Harold told me to be calm, that it would be okay. As we saw them walking away, Cairo and I both lost our patience and yelled out “EXCUSE ME!!! !” and they turned with pained, long-suffering expressions. “We’re just resetting the system ma’am.” And with that, all the bars came up and then down again. This time mine clicked. I looked around and everybody was now staring at me. Great. After that, the ride was anti-climactic. It was definitely fun and much faster and scarier than any woody we’ve been on before, but I’d just had too much stress for the day. Cairo’s head started pounding again from the hit she’d taken before, and though neither one of us wanted to say it, we’d had enough of Six Flags. We offered to wait for Harold while he went on some of the other Maximum Thrill rides, but he went in and figured the lines were too long to wait in alone. We both felt bad for him, but not quite enough to go through it all again. I expect if we’d paid for this day, I might have forced us on a few more rides, but since this was one of our two free days (I’d bought Go LA cards from Costco.com that let us have 4 days of many of the tourist attractions for the price of 2 days), I let us off the hook. As we were driving home, I turned on the wifi and searched for reviews of the X2. “Most extreme coaster on the planet” read one. 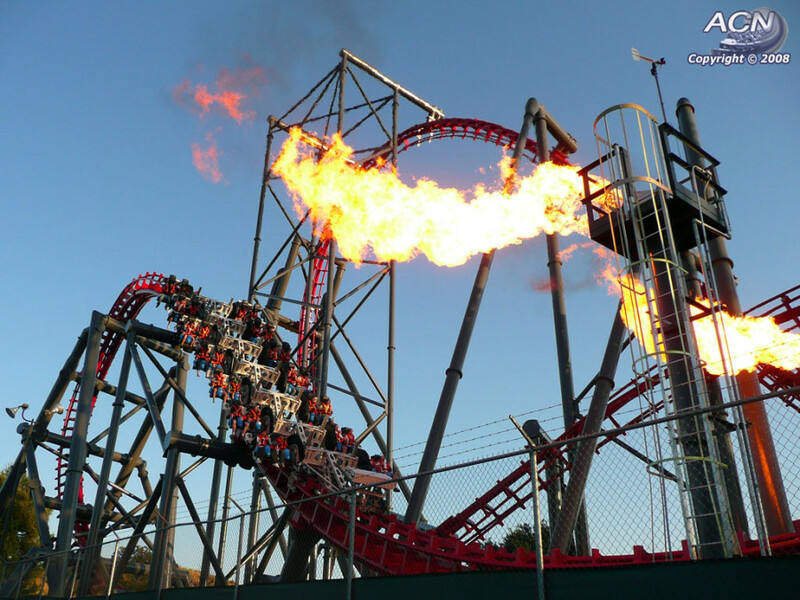 “Scariest ride in North America” said another. We had wanted more thrills from our rides. We should have been more careful with our wishes. Well, I have a fear of heights and I've always prided myself on pushing myself past my fears. But this was just much more than I was able to handle. I've learned, Six Flags parks are just not for me. When our kiddos were young, we would buy season passes to the local Six Flags in Vallejo. I could go on most of the rides there ONCE. Tried twice in a row on the same ride and that didn't go so well. Now I can take the simpler rides but I haven't been to a park in ages.